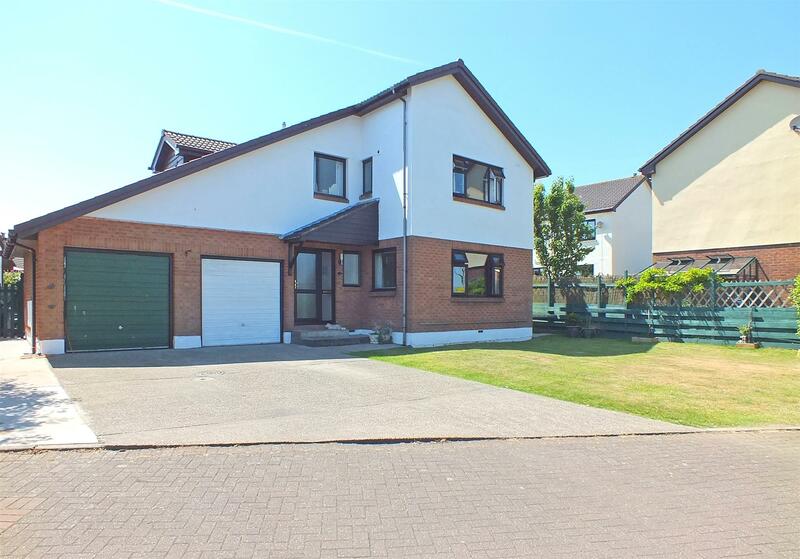 An Individual 4 Bed Detached Family House in a Highly Regarded Residential Area. Easy Access to Local Shops, Chemist, School, Doctors & Main Bus Route. Bright & Spacious Accommodation in Excellent Decorative Order Throughout. Comprising Entrance Area, Cloakroom WC & Inner Hall. Generous Lounge & Dining Room with Study Off. Breakfast Kitchen with Appliances. 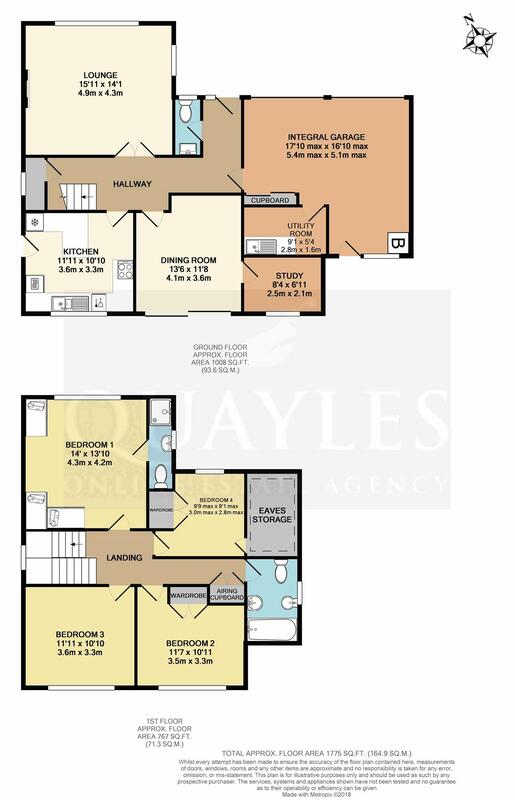 4 Bedrooms (3 Generous Doubles,1 with En suite Shower Room) plus Family Bathroom. Combination of uPVC & Timber Framed Double Glazing. Gas Fired Central Heating. Integral 1 1/2 Size Garage Incorporating a Utility Room to the Rear. Open Plan Frontage Providing Off Road Parking for 3 Vehicles. Generous, Enclosed Rear Garden with Patio, Lawn & Separate Vegetable Garden. From the Quarterbridge roundabout, head west along the Peel Road. Turn left at Braddan Bridge, just prior to the Church and continue up Saddle Road to the mini roundabout. Take the second exit onto the A6, Vicarage Road. At the second roundabout turn left into Stevensons Way and continue along, taking a right turn upon reaching Hilltop Rise. Follow the road around to the left and into the cul de sac where number 11 can be found on the right hand side. Obscure glazed uPVC door and sidelight to the entrance area. Coved ceiling. Recessed LED lighting. Power points. Door to cloakroom WC and integral garage. Wood strip flooring continues to inner hall. A half turned staircase leads to the first floor with a useful cupboard beneath. Telephone point and smoke detector. A pair of modern glazed, oak veneer doors lead to the lounge. A spacious, dual aspect room with one hardwood and one uPVC double glazed window. Modern inset electric fireplace with a mounting for a TV above. Coved ceiling with recessed LED lighting. Wall light points. TV and satellite points. A naturally bright and spacious room with uPVC sliding patio doors overlooking and leading out to the rear garden. Coved ceiling. High level TV point. Door to the study. Coved ceiling. Rear timber framed window. Telephone and internet connections. Fitted with an excellent range of modern wood effect wall, illuminated display, drawer and base units together with laminated work surfaces incorporating a breakfast bar. 'Diplomat' ceramic hob with a glass and brushed steel extractor above. Statesman electric oven and housing for a microwave. Integrated dish washer, fridge and freezer. Counter lighting and background tiling. Coved ceiling. Large uPVC window to the rear. Obscure glazed uPVC door to the side of the property. Ladder style radiator. 'Karndean' flooring. Fitted with a white suite of WC and hand basin set on a vanity unit. Coved ceiling. Hardwood framed, obscure double glazed window. A 1 1/2 size garage with a utility room built into the rear of one side. Two up and over doors (to be replaced 2018). Wall units. 'Alpha' gas fired combi boiler. Telephone point. Consumer unit. Access to the attic storage space. Light and power. Double glazed timber framed window and door to the rear garden. NB measurement includes the utility room which has also been measured separately. Fitted with basic units together with a stainless steel sink. Space for a washing machine and further appliances. Shelving and coat hooks. Vinyl floor covering. Hardwood double glazed window at the half landing. Coved ceiling with inset spot lights. Access to the loft. Built in, shelved airing cupboard. Double power point. Enjoying distant hill views towards Snaefell via a uPVC double glazed window. Benefiting from an extensive range of built in wardrobes, bed side units and storage lockers. Coved ceiling with recessed LED down lights. High level TV point. Door to the en suite shower room. Fully tiled to complement a contemporary white suite of push button flush WC and pedestal basin with a lever mixer tap along with a cubicle housing a fully plumbed shower. Mirror fronted illuminated vanity unit. Glass shelf and shaving mirror. Coved ceiling with inset downlights. Obscure glazed hardwood window. Ladder style towel warmer. 'Addvent' extractor. Vinyl floor covering. A generously proportioned double room located to the rear with a uPVC double glazed window. Coved ceiling. TV point. A further light and airy double room with a uPVC window to the rear. Recessed built in wardrobe with a hanging rail and shelving. Coved ceiling. A good sized room fitted with a white suite of WC, bidet, pedestal basin and panelled bath with a mixer shower over. Coved ceiling. Tiled walls. Ceiling spotlights. Obscure glazed uPVC window. Ceramic tiled floor. A large single room with a built in wardrobe fitted with a shelf and hanging rail. Front hardwood double glazed window. Access to extensive eaves storage space. Coved ceiling. A fully enclosed, south west facing garden which enjoys maximum sunshine exposure. Having a large patio, lawn and a further area which has been fenced off and laid with raised beds. Gated access to the front garden. Mains water, electricity and drainage. Gas fired central heating. Combination of timber framed and uPVC double glazing.